New York, World House Galleries, Drawings, Watercolors, Collages by 20th Century Masters, December 1959-January 1960, no. 12 (illustrated). A photo-certificate from the Comit Chagall dated Paris, 11 June 1998 accompanies this watercolor. In 1924-1925, Chagall worked on a series of drawings inspired by Nicolai Gogol's masterpiece of Russian literature, The Dead Souls. The project, initiated by Ambrose Vollard, was dear to Chagall, who empathized from experience with the hardship of the Russian peasantry. Gogol's words, read aloud to the artist by his wife Bella, inspired Chagall to conjure up a visual poetry to narrate the adventures of Pavel Tsitsjikov, who bought dead souls from landowners. 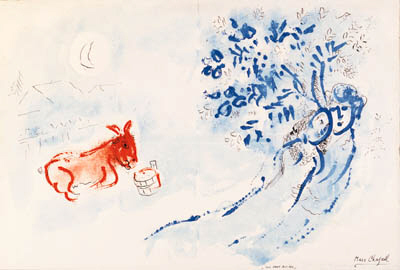 The suite of aquatints was finally published in 1948, after Chagall retrieved the plates from Vollard's estate. This watercolor is possibly related to a project for the publication of Les Ames mortes in that year.